What is a Blocking Patent? A blocking patent is a patent that prevents a third party from the practice or commercial exploitation of a modified version of the the device or process underlying the patented invention. When a patent stops another product or service (even if patented) from actually being produced because it’s execution would ultimately need to infringe upon it, it can then be referred to as a blocking patent. In practice companies employ blocking patents in a variety of strategically intentional ways. Suppose that a person, Sally, holds a patent for her invention of a bluetooth speaker, the Kube. Another person, James, creates an updated version of Sally’s Kube, with several added features and improvements not present in the original Kube—let’s call James’ invention the Ultra3. However, James cannot manufacture his Ultra3 without infringing Sally’s patent. In this case, the patent Sally holds for the Kube is a blocking patent. James’ best move would then be to try to cross-license with Sally. Now let’s say a third party, William, recognizes a few years down the line that in order to work with new battery technology which would provide better battery life and louder playback for customers both the Kube & Ultra3 would need a new set of internal technology. If William creates that and patents it, Sally and James would ultimately have to cross-license with him in order to keep the Kube & Ultra3 viable on the market. James’ patent on improved battery technology would essentially then block the necessary innovation for the original inventions to stay viable on the market. In January of 2017, a U.S. District Court ordered an injunction on sales of pharmaceutical companies Regeneron and Sanofi’s cholesterol medication, Praluent. This injunction on Praluent sales was the result of an ongoing patent dispute between Regeneron and Sanofi, and Amgen, the makers of a similar cholesterol medication called Repatha. Prior to the injunction, a lower court had already found Regeneron and Sanofi to be infringing on two patents held by Amgen. The patents in question cover a particular class of cholesterol-lowering medications called PCSK9 inhibitors; a class which includes Regeneron and Sanofi’s drug, Praluent. As the court upheld the validity of Amgen’s patents, they found Regeneron and Sanofi’s production and sale of Praluent to infringe on Amgen’s patents. In the case just described, the pharmaceutical company Amgen’s patents for the drug Repatha act as blocking patents. Because Amgen owns patents for the entire class of cholesterol-lowering drugs known as PCSK9 inhibitors, competing pharmaceutical companies cannot manufacture and sell their own PCSK9 inhibitors. Even if the exact formulation of a competing company’s PCSK9 inhibitor medication, such as Praluent, differs from the formulations of any drug manufactured by Amgen, the competing company’s practice of their new PCSK9 inhibitor drug will infringe on Amgen’s patents. This is because Amgen’s patents cover the underlying mechanism and processes by which PCSK9 inhibitors work to lower cholesterol, not just the particular formulation of any PCSK9 inhibitor drug invented by Amgen, such as Repatha. For more information on the patent dispute between Regeneron/Sanofi and Amgen regarding their PCSK9 inhibitor medications follow the links. In the paper, the authors examine the characteristics and impact of blocking patents. The authors find that patent applications which are cited as, “compromising the patentability of other applications, and that have never been cited as contributing to the state of the art, ”have a stronger impact on the likelihood of refusal or withdrawal than others”. The above is essentially their definition of a blocking patent. In addition, the authors find that patent applications which are subsequently withdrawn by their applicant are statistically the most effective in preventing other parties’ applications for patents of similar products. In the words of the authors, such patents have the greatest “killing power.”The sort of patent application just described—one which inhibits the success of other patent applications before being withdrawn by the applicant—is what the authors call a defensive patent application. 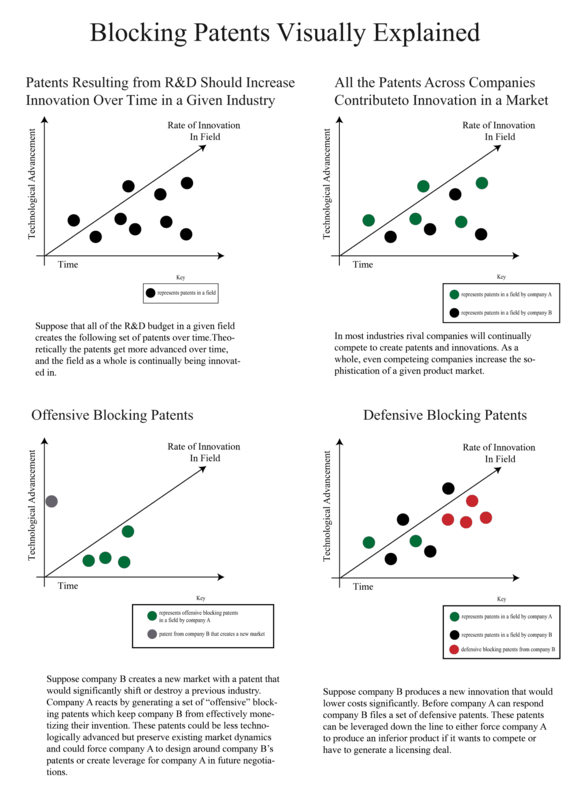 Defensive patent applications, “endow their owner with no exclusive right per se (as no patent is granted) but keep competitors away from the relevant technological field, hence presumably from the corresponding market.” Unlike defensive blocking patent applications, offensive patenting only occurs when a blocking patent application is actually granted. The authors write that, ”Offensive patenting is conceived to threaten, attack and weaken others. 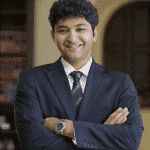 It can be used to prevent competitors from using a technology or to restrain their freedom to operate by filing patents at the margin of their areas of activity, for example surrounding high value patents with a screen of minor patents.” Defensive patent applications, on the other hand, largely function to keep the market open for the patent applicant in question to maneuver without being blocked by the patent applications of others. A Brief Note on Blocking Patents and Reverse Equivalents: Biotechnology as an Example, by Robert P Merges. This article covers the reverse doctrine of equivalents and the potential limits of blocking patents. Exclusion and Exclusive Use in Patent Law by Adam Mossoff. This article describes recent court decisions and their effect on legal nature of patents as constitutionally protected property with exclusionary rights. 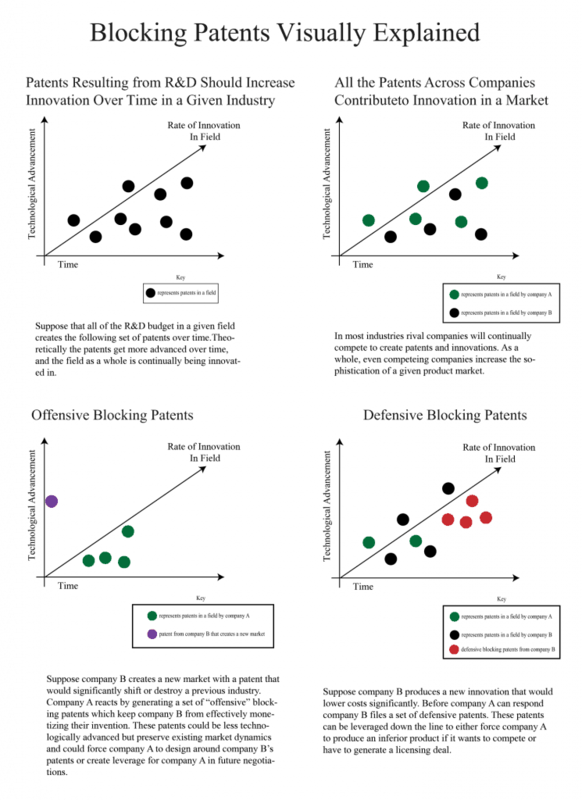 Used, blocking and sleeping patents: Empirical evidence from a large-scale inventor survey by Salvatore Torrisi, Alfonso Gambardella, Paola Giuri, Dietmar Harhoff, & Karin Hoisl. Information on patents and their strategic uses from a large scale survey of patent holders in US, Europe, and Japan. Study of blocking patents and many patents strategy by Japanese big companies by Yoshifumi Okuda and Yoshitoshi Tanaka found that 30% of patents filed by Japanese company were intended to cement first mover advantage in R&D.